On June 26th, 2000 the President of the United States and the British Prime Minister held simultaneous press conferences to announce that a rough draft of the human genome was ready for inspection. For the first time, humans knew (roughly) the complete sequence of their own DNA. The achievement was widely heralded in the press, vividly describing our species “blueprint,” our “recipe,” our “instruction book.” But how accurately does the string of 3.1 billion Gs, As, Ts and Cs describe the nearly 100 trillion cells in our body? Beyond documented sequence variations, accumulated mutations and all the extrachomosomal genetic information known to exist, what does the human genome sequence (or any sequence data for that matter) say? Consider the often-used analogy of DNA as a “blueprint” for a cell. Engineers and architects use blueprints to guide their construction projects, but could we, as biological engineers, use DNA sequence to guide us in the fabrication of a cell? We can’t yet make a lowly bacterial cell let alone a human cell even though we know the genome sequence. The limit arises not from our new status as a biological engineers but from the limited information in the DNA “blueprint” itself. Perhaps a better analogy, then, is DNA as a “recipe.” Recipes specify lists of ingredients, number of servings, cooking times and occasionally variations to try. Sequence data, in contrast, is far more difficult for us to interpret than a cooking recipe. We can make something to eat using a recipe, but what can we make knowing “GCACCACCACTAGAACCAATAGAA”? A cell can do something with that, but can we? 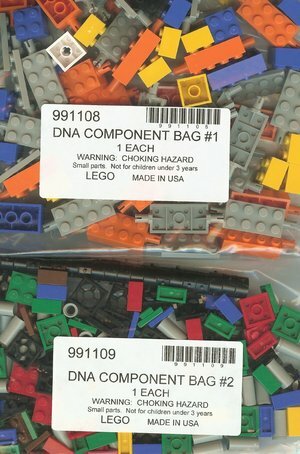 DNA as our “instruction book” is perhaps the least satisfying analogy of all. Beyond the fact that cells change expression patterns over time in ways that are not evident from the DNA sequence, there is also a multimillion-dollar industry selling books and promoting workshops to help us understand each other. No one yet has suggested we start understanding people by scanning each others’ basepair sequences, though the XY balance is considered important (see for example: Men Are From Mars, Women Are From Venus). A better analogy, and the one we will explore, is to think of DNA as a low-level programming language and a genome as a particular program. Like software, DNA has an alphabet but with only four letters in the genetic code. Since there are proof-reading mechanisms in the cell (or hardware) implementing the program, syntax errors are less likely to arise than in Python or Perl or C++. The code for cellular programs is messy but so are computer programs. Subroutines are often dependent on one another (the cell cycle and DNA replication for example) and parts of the program get reused in useful, but complicated and unpredictable ways (seen as cross-talk in signaling pathways for example). Genetic code and computer code are both susceptible to viruses that highjack normally benign functions. The analogy of the DNA as computer code is not perfect. We have to set aside the presumption of an intelligent agent responsible for writing the initial program as well as natural events that change the code over time (evolution leading to mutations). And no good tools exist for systematically debugging the genetic code. What would make genetic code easier to write? One idea is to make it a more “object oriented” language, defining units of known function that could be combined in standard and predictable ways. One effort to facilitate genetic programming can be found at The Registry for Standard Biological Parts (http://parts.mit.edu). There you will see a catalog of parts that describe basic biological functions. For example BBa_B0010 is the part number for a transcriptional terminator. Interested in a promoter? There are lots. A perennial favorite is BBa_R0010, the promoter from the bacterial lac operon, and you’re already familiar with BBa_R0085 from your protein engineering work since this part is the promoter recognized by the T7 RNA polymerase. The Registry of Standard Biological Parts makes its parts freely available to interested researchers and engineers, and allows registered users to add and annotate parts, as you will do later in this experimental module. In the first part of today’s lab you’ll browse the catalog at the Registry of Standard Biological Parts then you’ll use parts described there to design and specify a protein generating device. Finally, you’ll begin working with a bacterial strain engineered to sense and respond to light using parts from the registry. As a first time visitor to the Registry of Standard Biological Parts , you should consider registering for an account. As a registered user you’ll be empowered to add parts. Find the “User Accounts” link on the left hand menu of the Registry’s front page. This will take you to a login page that also asks, “Need an account?” Click on “Apply Now,” fill in the information on the registration page using “BE.109” as your affiliation, and your request will be processed over the next day or two. The parts available at the registry come in two flavors: basic parts encoding a particular biological function, and composite parts, which are made by combining the basic parts. To better understand what a “basic part” might be, go back to parts.mit.edu and clickon the green circle about “RBS” in the Parts Catalog on the front page. RBS stands for Ribosome Binding Site, a short sequence that’s also called the Shine-Dalgarno sequence after the researchers who identified it as the point of entry for the translation machinery. Without this sequence, a bacterial gene can be transcribed but is poorly translated. Add this sequence downstream of a promoter but upstream of the coding sequence, and you’ve got a place for the large and small ribosomal subunits to enter and begin work. You’ll see a number of parts that function as RBSs. They are color coded like traffic signals: green is a “go,” red is a “stop,” and yellow is a “lookout” indicator. For DNA that is Available, you’ll see a green letter “A” in the left most column. For DNA being Built, you’ll find a yellow letter “B” in that same column. Other parts are simply planned and these have no green, red or yellow designation. The second column tells you something about user experiences with each part. The green letter “W” indicates that the available part is Working…at least in someone’s hands. Many parts at the registry are untested, as you can tell by looking at even this small subset of parts. the information about the DNA itself such as its length and where it’s being kept at the Registry. Is it available and working? Is anything known about how well the part works? What is the sequence with “biobrick ends” (you’ll learn more about these next time)? What differences do you notice between the information you retrieve with “view the actual sequence” and “get sequence as shown”? Some composite parts are just intermediates in a larger assembly strategy but when the composite parts can “do something” they are usually called “devices.” “Systems” are made by combining devices to accomplish a specified task. Begin by searching for the composite part, BBa_F2620. 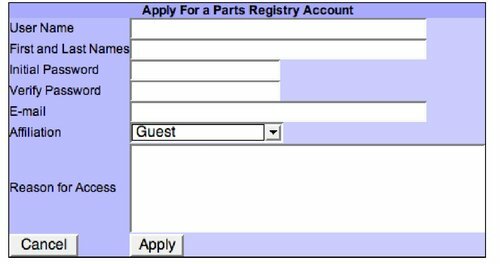 The part number can be typed into the “View Part” box in the lefthand menu on the Registry’s front page. The icon to the left of the part number tells you this part was made to facilitate signaling between cells. From the icons to the right of the part number you’ll know there are two promoters in the part, as well as a protein generator. If you want to know the most basic parts that were assembled into BBa_F2620, look at the “deep components” listed within the “Sequence and Features” section. You should answer the same questions about this composite part as you did for the basic one (questions 1 through 5 only), to hand in before you leave today. Now that you know a little bit about the kind of things you’ll find at the Registry and how to navigate the site, it’s time for you to design and specify a part of your own. Begin by looking at the existing examples of protein generators. What basic parts do most protein generators have? Are there exceptions? Try to figure out why some protein generators don’t have all the typical parts. Next specify a protein generator of your own. Decide what protein you want to make, how much of it you need and when you want it to be expressed. Choose the parts to make this happen. The teaching faculty can help you enter new parts if you need to. If you’ve chosen basic parts from the Registry, are they all working? Are they available? Before you leave today you should list the basic parts that you’ll be using to build your novel protein generator, write a sentence or two about what you expect them to do, and list ways to measure the output if such ways are available (this will depend on the protein you’ve chosen to generate, among other things). E. coli do not normally respond to light but a recent publication URL describes a combination of genes that lead to light-responsive expression of beta-galactosidase in E. coli. When the cells are grown in the dark, transcription of lacZ is high and the indicator in the media turns black. When the cells are grown in the light, there is very little transcription of the lacZ gene and the media’s natural color (yellowish) shows through. How precisely this expression can be controlled (spatially and temporally through different experimental conditions) is what you will investigate during this experimental module. For today, you can get used to this system with a simple test. You’ll plate a layer of cells on indicator medium in two dishes, and then incubate one dish in the light and the other in the dark until next time. You expect the dark grown plate to turn a dark color and the light grown plate to stay light. You’ll also grow some liquid cultures under the same light and dark conditions to measure beta-galactosidase activity next time. Some media has been prewarming in the 42°C incubator for you. The media is traditional LB supplemented with ferric ammonium citrate and “S-gal,” an artificial substrate for beta-galactosidase. When the enzyme cleaves S-gal in the presence of iron, a black precipitate forms changing the color of the media. The media also has agarose so it will harden as it cools. All manipulations should be with your best sterile technique to avoid contamination of your cultures. Dilute the overnight culture of cells 1:10. Use LB to dilute the cells and make at least 250 μl of this dilution to use for today's experiment. Add antibiotics (50 μl of ampicillin and 50 μl of chloramphenicol) to the prepared media. These will maintain the plasmids in the bacteria as the cells grow. Use the stir plate to mix but do not allow the media to remain at room temperature for long since it will begin to harden as it cools. Add 200 μl of cells to the media. Stir as before. Pipet approximately 20 ml with a 25 ml pipet into two Petri dishes and allow the media to harden on the bench before moving the plates into the incubator with the yellow hydroponic lamp. One Petri dish should be placed in a box as the “dark” sample and the other can be placed into the incubator as is…media side up of course. Add 10 μl of ampicillin and 10 μl of chloramphenicol. Add 10 μl of your 1:10 dilution of cells. Invert several times to mix. Place 5 ml into two Petri dishes. Wrap parafilm 3/4ths of the way around each dish to prevent evaporation. Add one dish to your “dark” box and place the other in the incubator on the platform rocker under the yellow light. "a terminator is analogous to a grounding device in electrical engineering"
"BBa_I14032 works just like a battery"
"the closest part I can find to work like a wire is an ORF"
Once you get your user account at the Registry, specify the protein generator you designed today. Print out the spec sheet to turn in. look to the past, i.e. consider synthetic biology’s similarities to other recently emerged technologies with dual-use or societal pitfalls (e.g. nuclear weapons, recombinant DNA, genetically modified foods, computer programming, downloadable music files). Specifically, you’ll identify and describe informative lessons from one of these or an example of your choosing. To get started on this assignment, you should write an articulate and working definition of synthetic biology. Begin by looking around the wiki, the web and in the literature to read the definitions others have offered. Next, use your definition to decide if the following are examples of synthetic biology, or under what circumstances these might fit your definition. Be sure to justify your answer briefly. Transfecting cultured embryonic stem cells from mice with a gene that turns the media green if the cells detect mustard gas. Once you have completed this part of the assignment you should start to think about what you would like a biological system to do. It will be tricky to find an idea that is both of interest and possible to build so start ruminating on this now. This page was last edited on 3 April 2006, at 10:55.